Alert! Alert! Mysterious aliens called the "neuroi" are attacking the earth! 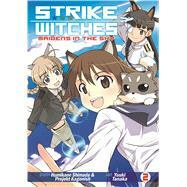 Nothing can harm them except for an elite team of magical girls who patrol the skies: the Strike Witches! In this second installment of Strike Witches: Maidens in the Sky, Miyafuji Yoshika is sent to complete her training on the far-off island of Britannia, where she finds new friends (each prettier than the next!) and grapples with new challenges. Yoshika learns more about her friends, stumbles on some of the Strike Witch battalion's deepest secrets, and searches for the source of her own magical powers. The entire cast of the popular anime is here, cheering Yoshika on (or getting in her way), as she continues her inner journey and faces the choice that will determine her destiny: remain a healer or become a soldier? Humikane Shimada is the creator of the Strike Witches franchise and has written numerous manga and novels in the series. Yuuki Tanaka is a Japanese manga artist whose works include Code Geass: Queen and Strike Witches: Maidens of the Sky.